Cairo, Egypt (CNN) -- The upper portion of a limestone likeness of King Tut's grandfather has been unearthed in Luxor, Egyptian officials said. 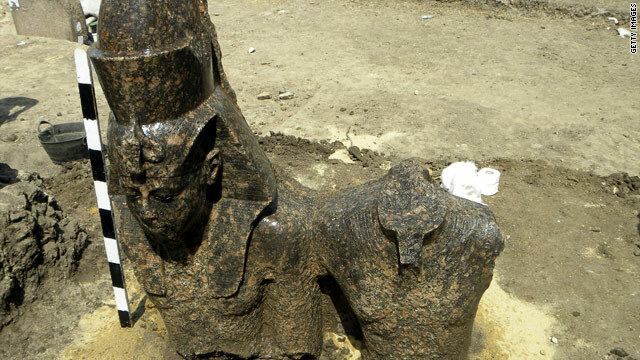 Investigators found the statue of Amenhotep III while excavating on the site of a large temple on Luxor's west bank, Egypt's Supreme Council of Antiquities announced in a statement Saturday. "The statue is one of the best new finds in the area because of its expert craftsmanship," the statement said, citing Zahi Hawass, the council's secretary general. The statue, which is 4 feet 3 inches (130 centimeters) tall and 3 feet 1 inch (95 centimeters) wide, depicts the pharaoh seated on a throne, accompanied by the Theban god Amun. The king wears the double crown of Egypt. Now experts must dig to find the rest of it. Amenhotep III, who lived until 1352 BC, was hardly a modest king. Hawass said there is an "overwhelming amount of statuary" depicting the ruler, who was the father of Amenhotep IV, better known as Akhenaten. There may be other statues of him at the site, according to the council's statement. Amenhotep III's reign was a time of wealth and stability, according to the British Museum. He inherited a great empire and took on many building projects.